Ambassador Morgenthau's Story. 1918. Chapter Twenty-One. The failure of the Allied fleet at the Dardanelles did not definitely settle, the fate of Constantinople. Naturally the Turks and the Germans felt immensely relieved when the fleet sailed away. But they were by no means entirely easy in their minds. The most direct road to the ancient capital still remained available to their enemies. "We cannot hold the Dardanelles without the military support of Bulgaria." This meant, of course, that unless Bulgaria aligned herself with Turkey and the Central Empires, the Gallipoli expedition would succeed, Constantinople would fall, the Turkish Empire would collapse, Russia would be reestablished as an economic and military power, and the war, in a comparatively brief period, would terminate in a victory for the Entente. Not improbably the real neutrality of Bulgaria would have had the same result. 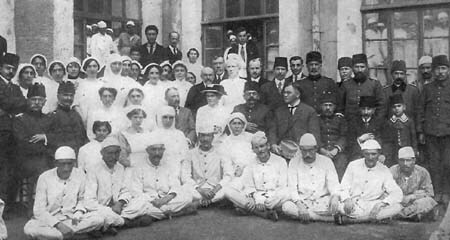 It is thus perhaps not too much to say that, in September and October of 1915, the Bulgarian Government held the duration of the war in its hands. This fact is of such preeminent importance that I call hardly emphasize it too strongly. I suggest that my readers take down the map of a part of the world with which they are not very familiar---that of the Balkan States, as determined by the Treaty of Bucharest. All that remains of European Turkey is a small irregular area stretching about one hundred miles west of Constantinople. The nation whose land is contiguous to European Turkey is Bulgaria. The main railroad line to Western Europe starts at Constantinople and runs through Bulgaria, by way of Adrianople, Philippopolis, and Sofia. At that time Bulgaria could muster an army of 500,000 well-trained, completely organized troops. Should these once start marching toward Constantinople, there was practically nothing to bar their way. Turkey had a considerable army, it is true, but it was then finding plenty of employment repelling the Allied forces at the Dardanelles and the Russians in the Caucasus. With Bulgaria hostile, Turkey could obtain neither troops nor munitions from Germany. Turkey would have been completely isolated and, under the pounding of Bulgaria, would have disappeared as a military force, and as a European state, in one very brief campaign. I wish to direct particular attention to this railroad, for it was, after all, the main strategic prize for which Germany was contending. After leaving Sofia it crosses northeastern Serbia, the most important stations being at Nish and Belgrade. From the latter point it crosses the River Save and later the River Danube, and thence pursues its course to Budapest and Vienna and thence to Berlin. Practically all the military operations that took place in the Balkans in 1915-16 had for their ultimate object the possession of this road. Once holding this line Turkey and Germany would no longer be separated; economically and militarily they would become a unit. 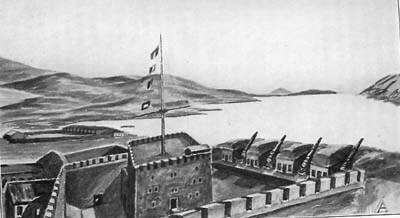 The Dardanelles, as I have described, was the link that connected Russia with her allies; with this passage closed Russia's collapse rapidly followed. The valleys of the Morava and the Maritza, in which this railroad is laid, constituted for Turkey a kind of waterless Dardanelles. In her possession it gave her access to her allies; in the possession of her enemies, the Ottoman Empire would go to pieces. Only the accession of Bulgaria to the Teutonic cause could give the Turks and Germans this advantage. As soon as Bulgaria entered, that section of the railroad extending to the Serbian frontier would at once become available. If Bulgaria joined the Central Powers as an active participant, the conquest of Serbia would inevitably follow, and this would give the link extending from Nish to Belgrade to the Teutonic powers. Thus the Bulgarian alliance would make Constantinople a suburb of Berlin, place all the resources of the Krupps at the disposal of the Turkish army, make inevitable the failure of the Allied attack on Gallipoli, and lay the foundation of that Oriental Empire which had been for thirty years the mainspring of German policy. It is thus apparent what my German friend meant when, in early September, he said that, "without Bulgaria we cannot hold the Dardanelles." Everybody sees this so clearly now that there is a prevalent belief that Germany had arranged this Bulgarian alliance before the outbreak of the war. On this point I have no definite knowledge. That the Bulgarian king and the Kaiser may have arranged this cooperation in advance is not unlikely. But we must not make the mistake of believing that this settled the matter, for the experience of the last few years shows us that treaties are not to be taken too seriously. Whether there was an understanding or not, I know that the Turkish officials and the Germans by no means regarded it as settled that Bulgaria would take their side. In their talks with me they constantly showed the utmost apprehension over the outcome; and at one time the fear was general that Bulgaria would take the side of the Entente. I had my first personal contact with the Bulgarian negotiations in the latter part of May, when I was informed that M. Koloucheff, the Bulgarian Minister, had notified Robert College that the Bulgarian students could not remain until the end of the college year, but would have to return home by June 5th. The Constantinople College for Women had also received word that all the Bulgarian girls must return at the same time. Both these American institutions had many Bulgarian students, in most cases splendid representatives of their country; it is through these colleges, indeed, that the distant United States and Bulgaria had established such friendly relations. But they had never had such an experience before. Everybody was discussing the meaning of this move., It seemed quite apparent. The chief topic of conversation at that time was Bulgaria. Would she enter the war? If so, on which side would she cast her fortunes? One day it was reported that she would join the Entente; the next day that she had decided to ally herself with the Central Powers. The prevailing belief was that she was actively bargaining with both sides and looking for the highest terms. Should Bulgaria go with the Entente, however, it would be undesirable to have any Bulgarian subjects marooned in Turkey. As the boys and girls in the American colleges usually came from important Bulgarian families---one of them was the daughter of General Ivanoff, who led the Bulgarian armies in the Balkan wars---the Bulgarian Government might naturally have a particular interest in their safety. The conclusion reached by most people was that Bulgaria had decided to take the side of the Entente. The news rapidly spread throughout Constantinople. The Turks were particularly impressed. Dr. Patrick, President of Constantinople College for Women, arranged a hurried commencement for her Bulgarian students, which I attended. It was a sad occasion, more like a funeral than the festivity that usually took place. I found the Bulgarian girls almost immediately, most in a hysterical state; they all believed that war was coming and that they were being bundled home merely to prevent them from failing into the clutches of the Turks. My sympathies were so aroused that we brought them down to the American Embassy, where we all spent a delightful evening. After dinner the girls dried their eyes and entertained us by singing many of their beautiful Bulgarian songs, and what had started as a mournful day thus had a happy ending. Next morning the girls all left for Bulgaria. A few weeks afterward the Bulgarian Minister told me that the Government had summoned the students home merely for political effect. There was no immediate likelihood of war, he said. But Bulgaria wished Germany and Turkey to understand that there was still a chance that she might join the Entente. Bulgaria, as all of us suspected, was apparently on the auction block. The one fixed fact in the Bulgarian position was the determination to have Macedonia. Everything, said Koloucheff, depended upon that. His conversations reflected the general Bulgarian view that Bulgaria had fairly won this territory in the first Balkan war, that the Powers had unjustly permitted her to be deprived of it, that it was Bulgarian by race, language, and tradition, and that there could be no permanent peace in the Balkans until it was returned to its rightful possessors. But Bulgaria insisted on more than a promise, to be redeemed after the war was over; she demanded immediate occupation. Once Macedonia were turned over to Bulgaria, she would join her forces to those of the Entente. There were two great prizes in the game then being played in the Balkans: one was Macedonia, which Bulgaria must have; and the other Constantinople, which Russia was determined to get. Bulgaria was entirely willing that Russia should have Constantinople if she herself could obtain Macedonia. I was given to understand that the Bulgarian General Staff had plans all completed for the capture of Constantinople, and that they had shown these plans to the Entente. Their programme called for a Bulgarian army of about 300,000 men who would besiege Constantinople twenty-three days from the time the signal to start should be given. But promises of Macedonia would not suffice; the Bulgarian must have possession. Bulgaria recognized the difficulties of the Allied position. She did not believe that Serbia and Greece would voluntarily surrender Macedonia, nor did she believe that the Allies would dare to take this country away from them by force. In that event, she thought that there was a danger that Serbia might make a separate peace with the Central Powers. On the other hand, Bulgaria would object if Serbia received Bosnia and Herzegovina as compensation for the loss of Macedonia---she felt that an enlarged Serbia would be a constant menace to her, and hence a future menace to peace in the Balkans. Thus the situation was extremely difficult and complicated. One of the best-informed men in Turkey was Paul Weitz, the correspondent of the Frankfurter Zeitung. Weitz was more than a journalist; he had spent thirty years in Constantinople; he had the most intimate personal knowledge of Turkish affairs, and he was the confidant and adviser of the German Embassy. His duties there were actually semi-diplomatic. Weitz had really been one of the most successful agencies in the German penetration of Turkey; it was common talk that he knew every important man in the Turkish Empire, the best way to approach him, and his price. I had several talks with Weitz about Bulgaria during those critical August and early September days. He said many times that it was not at all certain that she would join her forces with Germany. Yet on September 7th Weitz came to me with important news. The situation had changed over night. Baron Neurath, the Conseiller of the German Embassy at Constantinople, had gone to Sofia, and, as a result of his visit, an agreement had been signed that would make Bulgaria Germany's ally. Germany, said Weitz, had won over Bulgaria by doing something which the Entente had not been able and willing to do. It had secured her the possession at once of a piece of coveted territory. Serbia had refused to give Bulgaria immediate possession of Macedonia; Turkey, on the other hand, had now surrendered a piece of the Ottoman Empire. The amount of land in question, it is true, was apparently insignificant, yet it had great strategic advantages and represented a genuine sacrifice by Turkey. The Maritza River, a few miles north of Enos, bends to the east, to the north, and then to the west again, creating a block of territory, with an area of nearly 1,000 square miles, including the important cities of Demotica, Kara Agatch, and half of Adrianople. What makes this land particularly important is that it contains about fifty miles of the railroad which runs from Dedeagatch to Sofia. All this railroad, that is, except this fifty miles, is laid in Bulgarian territory; this short strip, extending through Turkey, cuts Bulgaria's communications with the Mediterranean. Naturally Bulgaria yearned for this piece of land; and Turkey now handed it over to her. This cession changed the whole Balkan situation and it made Bulgaria an ally of Turkey and the Central Powers. Besides the railroad, Bulgaria obtained that part of Adrianople which lay west of the Maritza River. In addition, of course, Bulgaria was to receive Macedonia, as soon as that province could be occupied by Bulgaria and her allies. I vividly remember the exultation of Weitz when this agreement was signed. "It's all settled," he told me. "Bulgaria has decided to join us. It was all arranged last night at Sofia." The Turks also were greatly relieved. For the first time they saw the way out of their troubles. The Bulgarian arrangement, Enver told me, had taken a tremendous weight off their minds. "We Turks are entitled to the credit," he said, "of bringing Bulgaria in on the side of the Central Powers. She would never have come to our assistance if we hadn't given her that slice of land. By surrendering it immediately and not waiting till the end of the war, we showed our good faith. It was very hard for us to do it, of course, especially to give up part of the city of Adrianople, but it was worth the price. We really surrendered this territory in exchange for Constantinople, for if Bulgaria had not come in on our side, we would have lost this city. Just think how enormously we have improved our position. We have had to keep more than 200,000 men at the Bulgarian frontier, to protect us against any possible attack from that quarter. We can now transfer all these troops to the Gallipoli peninsula, and thus make it absolutely impossible that the Allies' expedition can succeed. 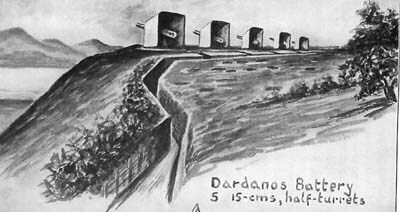 We are also greatly hampered at the Dardanelles by the lack of ammunition. But Bulgaria, Austria, and Germany are to make a joint attack on Serbia and will completely control that country in a few weeks. So we shall have a direct railroad line from Constantinople into Austria and Germany and can get all the war supplies which we need. With Bulgaria on our side no attack can be made on Constantinople from the north---we have created an impregnable bulwark against Russia. I do not deny that the situation had caused us great anxiety. We were afraid that Greece and Bulgaria would join hands, and that would also bring in Rumania. Then Turkey would have been lost; they would have had us between a pair of pincers. But now we have only one task before us, that is to drive the English and French at the Dardanelles into the sea. With all the soldiers and all the ammunition which we need, we shall do this in a very short time. We gave up a small area because we saw that that was the way to win the war." The outcome justified Enver's prophecies in almost every detail. Three months after Bulgaria accepted the Adrianople bribe, the Entente admitted defeat and withdrew its forces from the Dardanelles; and, with this withdrawal, Russia, which was the greatest potential source of strength to the Allied cause and the country which, properly organized and supplied, might have brought the Allies a speedy triumph, disappeared as a vital factor in the war. When the British and French withdrew from Gallipoli that action turned adrift this huge hulk of a country to flounder to anarchy, dissolution, and ruin. The Germans celebrated this great triumph in a way that was characteristically Teutonic. In their minds, January 17, 1916, stands out as one of the big dates in the war. There was great rejoicing in Constantinople, for the first Balkan express---or, as the Germans called it, the Balkanzug---was due to arrive that afternoon! The railroad station was decorated with flags and flowers, and the whole German and Austrian population of Constantinople, including the Embassy staffs, assembled to welcome the incoming train. As it finally rolled into the station, thousands of "hochs " went up from as many raucous throats. Since that January 17, 1916, the Balkanzug has ran regularly from. Berlin to Constantinople. The Germans believe that it is as permanent a feature of the new Germanic Empire as the line from Berlin to Hamburg.